The Camp David Accords were signed by Egyptian President Anwar El Sadat and Israeli Prime Minister Menachem Begin on 17 September 1978, following twelve days of secret negotiations at Camp David. The two framework agreements were signed at the White House, and were witnessed by United States President Jimmy Carter. The second of these frameworks (A Framework for the Conclusion of a Peace Treaty between Egypt and Israel) led directly to the 1979 Egypt-Israel Peace Treaty. Due to the agreement, Sadat and Begin received the shared 1978 Nobel Peace Prize. The first framework (A Framework for Peace in the Middle East), which dealt with the Palestinian territories, was written without participation of the Palestinians and was condemned by the United Nations. Carter's and Secretary of State Cyrus Vance's exploratory meetings gave a basic plan for reinvigorating the peace process based on a Geneva Peace Conference and had presented three main objectives for Arab-Israeli peace: Arab recognition of Israel's right to exist in peace, Israel's withdrawal from occupied territories gained in the Six Day War through negotiating efforts with neighboring Arab nations to ensure that Israel's security would not be threatened and securing an undivided Jerusalem. The Camp David Accords were the result of 14 months of diplomatic efforts by Egypt, Israel, and the United States that began after Jimmy Carter became President. The efforts initially focused on a comprehensive resolution of disputes between Israel and the Arab countries, gradually evolving into a search for a bilateral agreement between Israel and Egypt. 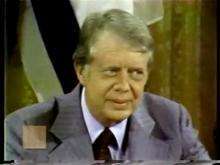 Upon assuming office on January 20, 1977, President Carter moved to rejuvenate the Middle East peace process that had stalled throughout the 1976 presidential campaign in the United States. Following the advice of a Brookings Institution report, Carter opted to replace the incremental, bilateral peace talks which had characterized Henry Kissinger's shuttle diplomacy following the 1973 Yom Kippur War with a comprehensive, multilateral approach. The Yom Kippur War further complicated efforts to achieve the objectives written in United Nations Security Council Resolution 242. Israel's Prime Minister Yitzhak Rabin and his successor, Menachem Begin, were both skeptical of an international conference. While Begin, who took office in May 1977, officially favored the reconvening of the conference, perhaps even more vocally than Rabin, and even accepted the Palestinian presence, in actuality the Israelis and the Egyptians were secretly formulating a framework for bilateral talks. Even earlier, Begin had not been opposed to returning the Sinai, but a major future obstacle was his firm refusal to consider relinquishing control over the West Bank. Carter visited the heads of state on whom he would have to rely to make any peace agreement feasible. By the end of his first year in office, he had already met with Anwar El Sadat of Egypt, King Hussein of Jordan, Hafez al-Assad of Syria, and Yitzhak Rabin of Israel. Despite the fact that he supported Sadat's peace initiative, King Hussein refused to take part in the peace talks; Begin offered Jordan little to gain and Hussein also feared he would isolate Jordan from the Arab world and provoke Syria and the PLO if he engaged in the peace talks as well. Hafez al-Assad, who had no particular interest in negotiating peace with Israel, also refused to come to the United States and only agreed to meet with Carter in Geneva. The key to an arrangement between Begin and Sadat took place on Sunday, 6 August 1978, as a result of a telephone call made that morning to the Israeli Prime Minister's office by a United States citizen who had an "idea for peace." The Prime Minister had not yet arrived at his office and the caller spoke to Mr. Yechiel Kadishai, a Begin staff head. Kadishai said that "no one was speaking with anyone and we expect a war in October." He also told the caller that if any high level talks were to occur the caller could be assured that they would be using his approach. Begin arrived, was informed of the plan, and contacted Sadat who agreed to the plan on that day. On the next day, Secretary of State Cyrus Vance traveled to the Middle East to obtain firsthand confirmation of the agreement between Israel and Egypt. The following day, Tuesday, 8 August, the Camp David meeting was scheduled to take place in exactly 4 weeks time; on 5 September 1978. The plan was that Israel agreed on 6 August to return the land to Egypt. Sadat’s then waning popularity would be greatly enhanced as a result of such an achievement. Israel's security was insured by the specific activities to take place during the "transition period." Those activities also were included in the "idea for peace" communicated to Begin's office on 6 August. President Anwar El Sadat came to feel that the Geneva track peace process was more show than substance, and was not progressing, partly due to disagreements with his Arab (mainly Syria, Libya, and Iraq) and his communist allies. He also lacked confidence in the Western powers to pressure Israel after a meeting with the Western leaders. His frustration boiled over, and after clandestine preparatory meetings between Egyptian and Israeli officials, unknown even to the NATO countries, in November 1977, Sadat became the first Arab leader to visit Israel. On 9 November 1977, President Sadat startled the world by announcing to parliament his intention to go to Jerusalem and speak before the Knesset. Shortly afterward, the Israeli government cordially invited him to address the Knesset in a message passed to Sadat via the US ambassador to Egypt. Ten days after his speech, Sadat arrived for the groundbreaking three-day visit, which launched the first peace process between Israel and an Arab state. As would be the case with later Israeli-Arab peace initiatives, Washington was taken by surprise; the White House and State Department were particularly concerned that Sadat was merely reaching out to reacquire Sinai as quickly as possible, putting aside the Palestinian problem. Considered as a man with strong political convictions who kept his eye on the main objective, Sadat had no ideological base, which made him politically inconsistent. The Sadat visit came about after he delivered a speech in Egypt stating that he would travel anywhere, "even Jerusalem," to discuss peace. That speech led the Begin government to declare that, if Israel thought that Sadat would accept an invitation, Israel would invite him. In Sadat's Knesset speech he talked about his views on peace, the status of Israel's occupied territories, and the Palestinian refugee problem. This tactic went against the intentions of both the West and the East, which were to revive the Geneva Conference. The gesture stemmed from an eagerness to enlist the help of the NATO countries in improving the ailing Egyptian economy, a belief that Egypt should begin to focus more on its own interests than on the interests of the Arab world, and a hope that an agreement with Israel would catalyze similar agreements between Israel and her other Arab neighbors and help solve the Palestinian problem. Prime Minister Begin's response to Sadat's initiative, though not what Sadat or Carter had hoped, demonstrated a willingness to engage the Egyptian leader. Like Sadat, Begin also saw many reasons why bilateral talks would be in his country's best interests. It would afford Israel the opportunity to negotiate only with Egypt instead of with a larger Arab delegation that might try to use its size to make unwelcome or unacceptable demands. Israel felt Egypt could help protect Israel from other Arabs and Eastern communists. In addition, the commencement of direct negotiations between leaders – summit diplomacy – would distinguish Egypt from her Arab neighbors. Carter's people apparently had no inkling of the secret talks in Morocco between Dayan and Sadat's representative, Hassan Tuhami, that paved the way for Sadat's initiative. Indeed, in a sense Egypt and Israel were ganging up to push Carter off his Geneva track. The basic message of Sadat's speech at the Knesset were the request for the implementation of Resolutions 242 and 338. Sadat's visit was the first step to negotiations such as the preliminary Cairo Conference in December 1977. A mechanism had yet to be created for Israel and Egypt to pursue the talks begun by Sadat and Begin in Jerusalem. The Egyptian president suggested to Begin that Israel place a secret representative in the American embassy in Cairo. With American "cover," the true identity of the Israeli, who would liaise between the Egyptian and Israeli leaders, would be known only to the American ambassador in Cairo. Sadat's liaison initiative spoke volumes about his reasons for wanting to make peace with Israel. He wanted an alliance with the American superpower and he wanted to kill Carter's Geneva initiative. His trip to Jerusalem signaled a major reorientation of Cairo's place in the global scheme of things, from the Soviet to the American camp. 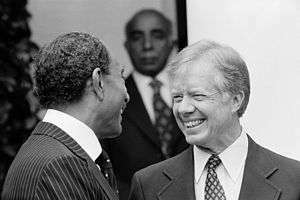 Carter's acceptance of the proposed liaison scheme would have signaled American backing for Sadat's unprecedented peace initiative. But Carter said no. However, Carter could not thwart the Israeli-Egyptian peace push. Within days Israeli journalists were allowed into Cairo, breaking a symbolic barrier, and from there the peace process quickly gained momentum. An Israeli-Egyptian working summit was scheduled for 25 December in Ismailiya, near the Suez Canal. 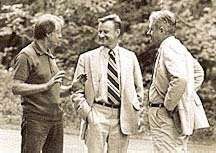 Accompanied by their capable negotiating teams and with their respective interests in mind, both leaders converged on Camp David for 13 days of tense and dramatic negotiations from 5 to 17 September 1978. By all accounts, Carter's relentless drive to achieve peace and his reluctance to allow the two men to leave without reaching an agreement are what played the decisive role in the success of the talks. Carter's advisers insisted on the establishment of an Egyptian-Israeli agreement which would lead to an eventual solution to the Palestine issue. They believed in a short, loose, and overt linkage between the two countries amplified by the establishment of a coherent basis for a settlement. However, Carter felt they were not "aiming high enough" and was interested in the establishment of a written "land for peace" agreement with Israel returning the Sinai Peninsula and West Bank. Numerous times both the Egyptian and Israeli leaders wanted to scrap negotiations, only to be lured back into the process by personal appeals from Carter. Considered as an excellent mediator who arbitrated concessions with confidence, he played a tireless commitment to find formulas, definitions, and solutions to the many intricate variables, regardless of perceived or real political limitations, and was capable of soothing fears and anxieties, always with the goal of keeping the negotiations going. He gradually understood the importance historical events had upon determining personal ideology, but he would not allow it to constrain his political options, and he did not want them to limit the options of those with whom he was negotiating. Begin and Sadat had such mutual antipathy toward one another that they only seldom had direct contact; thus Carter had to conduct his own microcosmic form of shuttle diplomacy by holding one-on-one meetings with either Sadat or Begin in one cabin, then returning to the cabin of the third party to relay the substance of his discussions. Begin and Sadat were "literally not on speaking terms," and "claustrophobia was setting in." A particularly difficult situation arose on the tenth stalemated day of the talks. The issues of Israeli settlement withdrawal from the Sinai and the status of the West Bank created what seemed to be an impasse. In response, Carter had the choice of trying to salvage the agreement by conceding the issue of the West Bank to Begin, while advocating Sadat's less controversial position on the removal of all settlements from the Sinai Peninsula. Or he could have refused to continue the talks, reported the reasons for their failure, and allowed Begin to bear the brunt of the blame. Carter chose to continue and for three more days negotiated. During this time, Carter even took the two leaders to the nearby Gettysburg National Military Park in the hopes of using the American Civil War as a simile to their own struggle. Consequently, the 13 days marking the Camp David Accords were considered a success. Partly due to Carter's determination in obtaining an Israeli-Egyptian agreement, a full two-week pledge to a singular international problem. Additionally, Carter was beneficiary to a fully pledged American foreign team. Likewise, the Israeli delegation had a stable of excellent talent in Ministers Dayan and Weizman and legal experts Dr. Meir Rosenne and Aharon Barak. Furthermore, the absence of the media contributed to the Accord's successes: there were no possibilities provided to either leader to reassure his political body or be driven to conclusions by members of his opposition. An eventual scrap of negotiations by either leader would have proven disastrous, resulting in taking the blame for the summit's failure as well as a disassociation from the White House. Ultimately, neither Begin nor Sadat was willing to risk those eventualities. Both of them had invested enormous amounts of political capital and time to reach an agreement. Egyptian President Anwar Sadat and Israeli Prime Minister Menachem Begin acknowledge applause during a joint session of Congress in Washington, D.C., during which President Jimmy Carter announced the results of the Camp David Accords, 18 September 1978. "Remarks on the Signing of the Camp David Accords"
Jimmy Carter, seated with Egyptian President Anwar Sadat and Israeli Prime Minister Menachem Begin, makes statements at a Joint session of the United States Congress following the Camp David Accords. 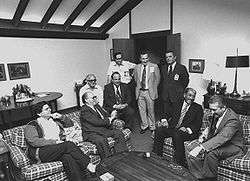 The Camp David Accords comprise two separate agreements: "A Framework for Peace in the Middle East" and "A Framework for the Conclusion of a Peace Treaty between Egypt and Israel", the second leading towards the Israel-Egypt Peace Treaty signed in March 1979. The agreements and the peace treaty were both accompanied by "side-letters" of understanding between Egypt and the U.S. and Israel and the U.S. The agreed basis for a peaceful settlement of the conflict between Israel and its neighbors is United Nations Security Council Resolution 242, in all its parts. The framework itself consists of 3 parts. The first part of the framework was to establish an autonomous self-governing authority in the West Bank and the Gaza strip and to fully implement Resolution 242. The Accords recognized the "legitimate rights of the Palestinian people", a process was to be implemented guaranteeing the full autonomy of the people within a period of five years. Begin insisted on the adjective "full" to confirm that it was the maximum political right attainable. This full autonomy was to be discussed with the participation of Israel, Egypt, Jordan and the Palestinians. The withdrawal of Israeli troops from the West Bank and Gaza was agreed to occur after an election of a self-governing authority to replace Israel's military government. The Accords did not mention the Golan Heights, Syria, or Lebanon. This was not the comprehensive peace that Kissinger, Ford, Carter, or Sadat had in mind during the previous American presidential transition. It was less clear than the agreements concerning the Sinai, and was later interpreted differently by Israel, Egypt, and the United States. The fate of Jerusalem was deliberately excluded from this agreement. The second part of the framework dealt with Egyptian-Israeli relations, the real content worked out in the second Egypt—Israel framework. The third part, "Associated Principles," declared principles that should apply to relations between Israel and all of its Arab neighbors. Egypt, Israel, Jordan and the representatives of the Palestinian people should participate in negotiations on the resolution of the Palestinian problem in all its aspects. (1.) Egypt and Israel agree that, in order to ensure a peaceful and orderly transfer of authority, and taking into account the security concerns of all the parties, there should be transitional arrangements for the West Bank and Gaza for a period not exceeding five years. In order to provide full autonomy to the inhabitants, under these arrangements the Israeli military government and its civilian administration will be withdrawn as soon as a self-governing authority has been freely elected by the inhabitants of these areas to replace the existing military government. (2.) Egypt, Israel, and Jordan will agree on the modalities for establishing elected self-governing authority in the West Bank and Gaza. The delegations of Egypt and Jordan may include Palestinians from the West Bank and Gaza or other Palestinians as mutually agreed. The parties will negotiate an agreement which will define the powers and responsibilities of the self-governing authority to be exercised in the West Bank and Gaza. A withdrawal of Israeli armed forces will take place and there will be a redeployment of the remaining Israeli forces into specified security locations. The agreement will also include arrangements for assuring internal and external security and public order. A strong local police force will be established, which may include Jordanian citizens. In addition, Israeli and Jordanian forces will participate in joint patrols and in the manning of control posts to assure the security of the borders. (3.) When the self-governing authority (administrative council) in the West Bank and Gaza is established and inaugurated, the transitional period of five years will begin. As soon as possible, but not later than the third year after the beginning of the transitional period, negotiations will take place to determine the final status of the West Bank and Gaza and its relationship with its neighbors and to conclude a peace treaty between Israel and Jordan by the end of the transitional period. These negotiations will be conducted among Egypt, Israel, Jordan and the elected representatives of the inhabitants of the West Bank and Gaza. ... The negotiations shall be based on all the provisions and principles of UN Security Council Resolution 242. The negotiations will resolve, among other matters, the location of the boundaries and the nature of the security arrangements. The solution from the negotiations must also recognize the legitimate right of the Palestinian peoples and their just requirements. The framework merely concerned autonomy of the inhabitants of West Bank and Gaza. It neither mentions the status of Jerusalem, nor the Palestinian Right of Return. The UN General Assembly rejected the Framework for Peace in the Middle East, because the agreement was concluded without participation of UN and PLO and did not comply with the Palestinian right of return, of self-determination and to national independence and sovereignty. December 1978, it declared in Resolution 33/28 A, that agreements were only valid if they are within the framework of the United Nations and its Charter and its resolutions, include the Palestinian right of return and the right to national independence and sovereignty in Palestine, and concluded with the participation of the PLO. Also the passive attitude of the Security Council was criticised. On 6 December 1979, the UN condemned in Resolution 34/70 all partial agreements and separate treaties that did not meet the Palestinian rights and comprehensive solutions to peace; it condemned Israel's continued occupation and demanded withdrawal from all occupied territories. On 12 December, in Resolution 34/65 B, she rejected more specific parts of the Camp David Accords and similar agreements, which were not in accordance with mentioned requirements. All such partial agreements and separate treaties were strongly condemned. The part of the Camp David accords regarding the Palestinian future and all similar ones were declared invalid. The second framework outlined a basis for the peace treaty six months later, in particular deciding the future of the Sinai peninsula. Israel agreed to withdraw its armed forces from the Sinai, evacuate its 4,500 civilian inhabitants, and restore it to Egypt in return for normal diplomatic relations with Egypt, guarantees of freedom of passage through the Suez Canal and other nearby waterways (such as the Straits of Tiran), and a restriction on the forces Egypt could place on the Sinai peninsula, especially within 20–40 km from Israel. This process would take three years to complete. Israel also agreed to limit its forces a smaller distance (3 km) from the Egyptian border, and to guarantee free passage between Egypt and Jordan. With the withdrawal, Israel also returned Egypt's Abu-Rudeis oil fields in western Sinai, which contained long term, commercially productive wells. The agreement also resulted in the United States committing to several billion dollars worth of annual subsidies to the governments of both Israel and Egypt, subsidies which continue to this day, and are given as a mixture of grants and aid packages committed to purchasing U.S. materiel. From 1979 (the year of the peace agreement) to 1997, Egypt received military aid of US$1.3 billion annually, which also helped modernize the Egyptian military. (This is beyond economic, humanitarian, and other aid, which has totaled more than US$25 billion.) Eastern-supplied until 1979, Egypt now received American weaponry such as the M1A1 Abrams Tank, AH-64 Apache gunship and the F-16 fighter jet. In comparison, Israel has received $3 billion annually since 1985 in grants and military aid packages. President Anwar Sadat's signing of the Camp David Accords on 17 September 1978 and his shared 1978 Nobel Peace Prize with Israeli Prime Minister Menachem Begin led to his assassination by dissatisfied Islamic extremists from within Egypt. The group was outraged over the president's decision to make peace with Israel. On 6 October 1981 President Anwar Sadat was assassinated by members of the Egyptian Islamic Jihad during the annual victory parade held in Cairo to celebrate Egypt's crossing of the Suez Canal. The president's personal protection was infiltrated by 4 members of this organization who were hiding in a truck passing through the military parade with other military vehicles. As the truck approached the president, the leader of the belligerents—Lieutenant Khalid Islambouli—came out of the truck and threw three grenades towards the president; only one of the three exploded. The rest of the team opened fire with automatic assault rifles and struck President Sadat with 37 rounds. He was airlifted to a military hospital where, despite the efforts of 11 doctors and surgeons, he died just 2 hours after arriving. In total, 11 were killed from collateral gunfire and 28 were injured. Among the killed were the Cuban ambassador, an Omani general, and a Coptic Orthodox bishop. Among the wounded were Vice President Hosni Mubarak, Irish Defence Minister James Tully, and four US military liaison officers. One of the assassins was killed and the other three were wounded and taken into custody. The surviving assassins were tried and found guilty of assassinating the president and killing 10 others in the process; they were sentenced to capital punishment and were executed by firing squad in April of the following year. "The normalization of relations [between Israel and Egypt] went into effect in January 1980. Ambassadors were exchanged in February. The boycott laws were repealed by Egypt's National Assembly the same month, and some trade began to develop, albeit less than Israel had hoped for. In March 1980 regular airline flights were inaugurated. Egypt also began supplying Israel with crude oil". "The Accords were another interim agreement or step, but negotiations that flowed from the Accords slowed for several reasons. These included an inability to bring the Jordanians into the discussions; the controversy over settlements; the inconclusive nature of the subsequent autonomy talks; domestic opposition sustained by both Begin and Sadat and, in Sadat’s case, ostracism and anger from the Arab world; the emergence of a what became a cold peace between Egypt and Israel; and changes in foreign policy priorities including discontinuity in personnel committed to sustaining the negotiating process". 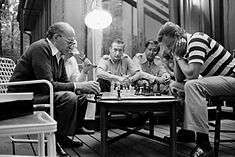 The time that has elapsed since the Camp David Accords has left no doubt as to their enormous ramifications on Middle Eastern politics. Most notably, the perception of Egypt within the Arab world changed. With the most powerful of the Arab militaries and a history of leadership in the Arab world under Nasser, Egypt had more leverage than any of the other Arab states to advance Arab interests. Egypt was subsequently suspended from the Arab League from 1979 until 1989. When the Camp David accords were signed, Jordan's King Hussein saw it as a slap to the face when Sadat volunteered Jordan's participation in deciding how functional autonomy would work. More specifically, Sadat effectively said that Jordan would have a role in how the West Bank would be administered. Like the Rabat Summit Resolution, the Camp David Accords circumscribed Jordan's objective to reassert its control over the West Bank. Focusing as it did on Egypt, the Carter administration accepted Sadat's claim that he could deliver Hussein. However, with Arab world opposition building against Sadat, Jordan could not risk accepting the Accords without the support from powerful Arab neighbours, like Iraq, Saudi Arabia, and Syria. Hussein consequently felt diplomatically snubbed. One of Carter's regrets was allowing Sadat to claim that he could speak for Hussein if Jordan refused to join the talks, but by then the damage was done to the Jordanians. United States President Jimmy Carter greeting Egyptian President Anwar Sadat at the White House shortly after the Camp David Accords went into effect, 8 April 1980. The Camp David Accords also prompted the disintegration of a united Arab front in opposition to Israel. Egypt's realignment created a power vacuum that Saddam Hussein of Iraq, at one time only a secondary power, hoped to fill. Because of the vague language concerning the implementation of Resolution 242, the Palestinian problem became the primary issue in the Arab-Israeli conflict immediately following the Camp David Accords (and, arguably, until today). Many of the Arab nations blamed Egypt for not putting enough pressure on Israel to deal with the Palestinian problem in a way that would be satisfactory to them. Syria also informed Egypt that it would not reconcile with the nation unless it abandoned the peace agreement with Israel. Lastly, the biggest consequence of all may be in the psychology of the participants of the Arab-Israeli conflict. The success of Begin, Sadat, and Carter at Camp David demonstrated to other Arab states and entities that negotiations with Israel were possible—that progress results only from sustained efforts at communication and cooperation. Despite the disappointing conclusion of the 1993 Oslo Accords between the PLO and Israel, and even though the 1994 Israel-Jordan Treaty of Peace has not fully normalized relations with Israel, both of these significant developments had little chance of occurring without the precedent set by Camp David. Although most Israelis supported the Accords, the Israeli settler movement opposed them because Sadat would not agree to a treaty in which Israel had any presence in the Sinai Peninsula at all, Israel had to withdraw from the entire Sinai Peninsula. Israeli settlers tried to prevent the government from dismantling their settlements. In Israel, there is lasting support of the Camp David Peace Accords, which have become a national consensus, supported by 85% of Israelis according to a 2001 poll taken by the Jaffee Center for Strategic Studies (Israel based). Nevertheless, a minority of Israelis believe the price Israel paid for the peace agreement was too high for its present gains, i.e. having relinquished the entire Sinai Peninsula, with its oil, tourism and land resources (Israel has no other oil wells), and the trauma of evacuating thousands of its Israeli inhabitants (many resisted, as in the settlement of Yamit and had to be forcefully evacuated, a phenomenon encountered also in the subsequent Israeli withdrawal from Gaza in 2005, known as the disengagement). For Israel, perhaps the most evident tangible benefit of the agreement with Egypt (other than the subsequent U.S. aid, which Egypt also received) was a peaceful mutual border, enabling the Israel Defense Forces to reduce their levels of alert on Israel's southwestern frontier. Although Egypt and Israel generally abided by the agreement since 1978, in the following years a common belief emerged in Israel that the peace with Egypt is a "cold peace". Others feel that the Peace agreement was between the Israeli people and Egypt's charismatic President Anwar El Sadat, rather than with the Egyptian people, who were not given the opportunity to accept or reject the agreement with a free vote or a representative majority. ↑ "Stein, Kenneth 2000, pp. 229-228"
↑ George Lenczowski, American Presidents and the Middle East, Duke University Press, 1990 p.164. ISBN 0-8223-0972-6. From Zbigniew Brzezinski, Power and Principle: Memoirs of the National Security Advisor 1977–1981, (New York: Farrar, Straus and Giroux, 1983), p.88. [Carter] outlined to Begin his program, which consisted of five points: (1) achieve a comprehensive peace affecting all of Israel's neighbors: (2) peace to be based on UN Resolution 242: (3) peace would involve open borders and free trade; (4) peace would call for Israeli withdrawal from occupied territories to secure borders; (5) a Palestinian entity (but not an independent nation) should be created. Begin responded that he could accept all of these points except the Palestinian entity. ↑ Stein, Kenneth. "Heroic Diplomacy: Sadat, Kissinger, Carter, Begin, and the Quest for Arab-Israeli Peace". Taylor & Francis, 1999, p.7. ↑ Feron, James. "Menachem Begin, Guerrilla Leader Who Became Peacemaker." The New York Times. 9 March 1992. 15 February 2009. ↑ "Camp David Accords: Jimmy Carter Reflects 25 Years Later". Carter Center. 17 September 2003. Retrieved 1 February 2015. ↑ Stein, Kenneth. "Heroic Diplomacy: Sadat, Kissinger, Carter, Begin, and the Quest for Arab-Israeli Peace". Taylor & Francis, 1999, p.252. ↑ "The Camp David Accords." Jimmy Carter Library and Museum. 21 July 2001. 28 April 2008. 1 2 3 4 Stein, Kenneth. "Heroic Diplomacy: Sadat, Kissinger, Carter, Begin, and the Quest for Arab-Israeli Peace". Taylor & Francis, 1999, p.254. ↑ "Egypt" Archived 26 January 2011 at the Wayback Machine. U.S. Department of State. March 2008. 28 April 2008. ↑ Benhorin, Yitzhak. "Israel still top recipient of US foreign aid." Ynetnews. 2 August 2007. 28 April 2008. ↑ Ronen, Joshua. "Poll: 58% of Israelis back Oslo process." Archived 2 May 2008 at the Wayback Machine. Tel Aviv University. 7 June 2001. 28 April 2008. Armstrong, Karen. Jerusalem: One City, Three Faiths. New York: Ballantine Books, 1996. Bregman, Ahron Elusive Peace: How the Holy Land Defeated America. Eran, Oded. "Arab-Israel Peacemaking." Sela. Gold, Dore. The Fight for Jerusalem: Radical Islam, the West, and the Future of the Holy City. Washington, DC: Regnery Publishing, Inc., 2007. Meital, Yoram. Egypt's Struggle for Peace: Continuity and Change, 1967–1977. Sela, Avraham, ed. The Continuum Political Encyclopedia of the Middle East. New York: Continuum, 2002. Adam Curtis' 2004 documentary The Power of Nightmares, in its second and third part, studies the Camp David Accords from the point of view of fundamentalist Muslims.